Prickly poppy (botanical name, Argemone mexicana) is a plant species that is mostly found in Mexico, but, over the centuries, has been extensively naturalized in several other regions of the world, including the United States, Africa, India as well as Ethiopia. Prickly poppy is an annually growing herb having vivid yellow sap. This herb has been used by numerous people, counting those in the plant's native area, the natives of the western regions of the United States as well as some parts of Mexico. An annual herb, the prickly poppy plant grows up to a height of three feet and occasionally even taller. The plant bears white blotched thistle-like leaves that are without stalk and spiny-toothed. The herb produces yellow or orange colored flowers during the period June and September or throughout the year in the southern climatic regions. The flowers are usually about 2.5 inches in diameter and are followed by prickly seed-pods that are approximately one inch long. Argemone mexicana is a plant that not only produces a large number of seeds (just like Papaver somniferum), but is easy to sprout as well. The seeds look very similar to culinary poppy seeds that most are familiar with, but they are about twice the size. Simply scatter these on a flowerbed during the spring, and you will have a fast-growing garden that sprouts in a week or two at most. Mexican prickly poppy is poisonous to livestock, but is not readily eaten, so there are relatively few cases of poisoning from this plant. However, plants in hay have caused poisoning. Seeds are its most toxic part, but the entire plant contains toxic elements. Any person who recklessly tries to pick a prickly poppy soon comes to learn the reason behind the name of the plant - in effect, the leaves as well as the seedpods of the plant are so well protected with needle-sharp spine that one must be careful while handling this plant. While the sharp spines may not make the plant very popular among people, they do protect both humans and animals from the adverse effects of the toxic substances enclosed by the plant. In case any animal, for instance, a goat, continues to graze on this harsh provision, the animal will not only suffer, but even those who will drink its milk will suffer adverse effects, as the poisons of the plant are passed on to the animal's milk. Humans coming in contact with prickly poppy are likely to suffer from dropsy or edema - a medical condition wherein the body retains fluid unusually. Notwithstanding the adverse effects of taking prickly poppy internally, there was a time when the herb was applied externally to treat a number of health conditions. Like other members of the poppy family, the prickly poppy has a long history as a traditional medicine. According to available records, the Comanche Indians, a Native American people, used an extract of the seeds to cure aching eyes. Later on, other traditional healers also recommended the extract as a cure for lesions and warts. Freshly obtained sap or latex yielded by prickly poppy encloses elements that dissolve proteins and it is used for treating cold sores, warts as well as blotches on the lips. On the other hand, the entire prickly poppy also works as a gentle palliative/ painkiller. Using small doses of an infusion prepared with the seeds of prickly poppy works as a sedative for children suffering from asthma. This is a widespread practice in Cuba. When this infusion is used in large amounts the oil present in the seeds works as a purgative. The flowers of prickly poppy possess expectorant properties and, hence, are very useful in treating coughs as well as other problems relating to the chest. An infusion prepared with the herb is used to alleviate kidney pain, to facilitate in getting rid of a torn placenta and overall to aid in cleansing the body following childbirth. After the Spanish arrived in Sonora, they included this herb in their pharmacopeia and named it cardosanto. It is important to note that cardosanto ought not to be wrongly translated to blessed thistle (botanical name, Cnicus benedictus). 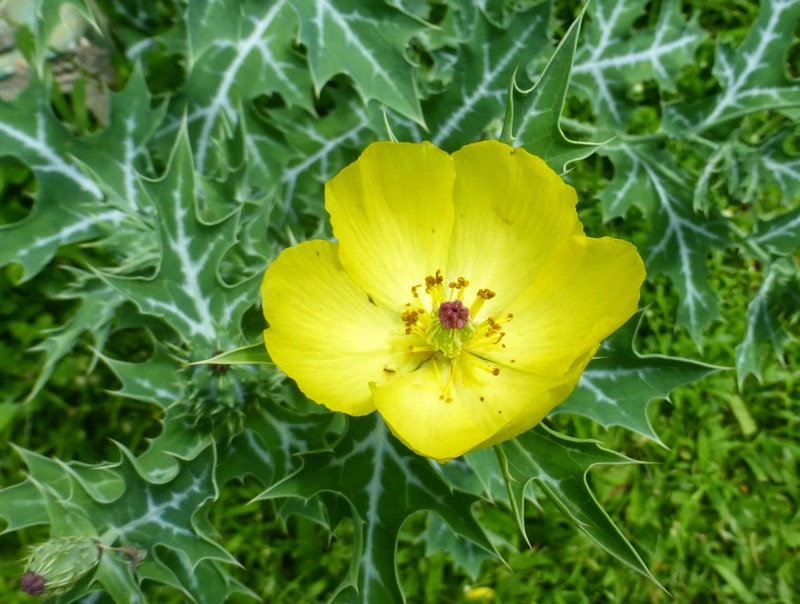 Prickly poppy was used by the Hispanic people in the form of a sedative (tranquilizer) as well as a palliative tea with a view to provide relief from migraine headaches among other things. The seeds of prickly poppy are used internally as a laxative. A light yellow latex-like substance is secreted by the prickle poppy seed pods when they are cut open. In effect, this argemone sap encloses berberine and protopine and is generally used therapeutically as a tranquilizer. 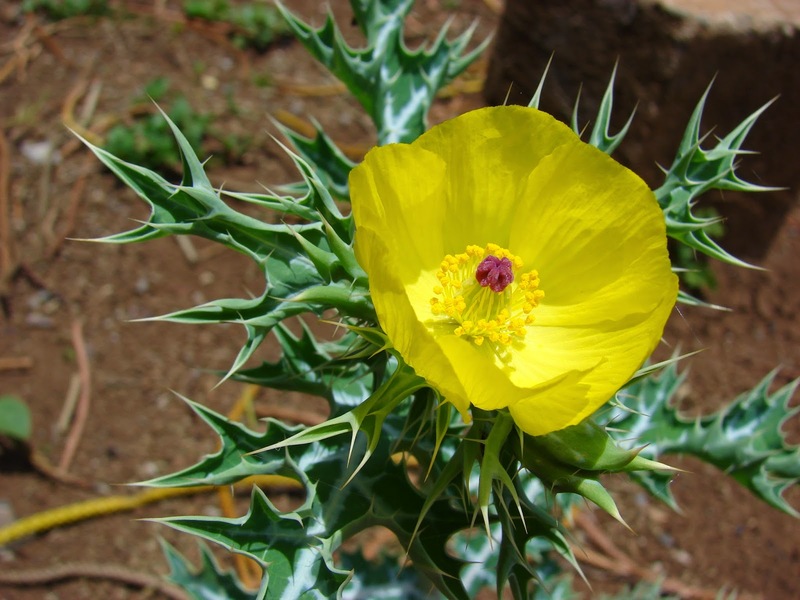 Traditional healers in Mali use the herb prickly poppy to treat malaria. The Seri tribe of northern Mexico use a tea made from the leaves of Argemone mexicana to treat kidney pains. This tea is also said to dispel bad blood that accumulates during birth. The Pima also use such a tea to treat kidney and bladder troubles. The Yucatec use the plant to treat gallbladder troubles. Apart from these countries, people in India also use prickly poppy in different ways. While the plant is used as a gentle pain killer owing to its alkaloid content, the fresh yellowish and milky acid latex yielded by the herb is said to enclose substances that help to dissolve proteins and, hence, it can be used to treat cold sores, warts, cutaneous disease (ailments related to the skin), and itches and so on. The root of the prickly poppy is known to gradually restore the healthy functions of the body (alterative) and, hence, can be utilized to treat persistent skin disorders. In addition, the roots of the herb are expectorant and, therefore, can be used to treat coughs as well as other aliments relating to the chest. The seeds of this plant are demulcent (a soothing agent or drug), emetic (a medication that causes vomiting), expectorant and laxative. 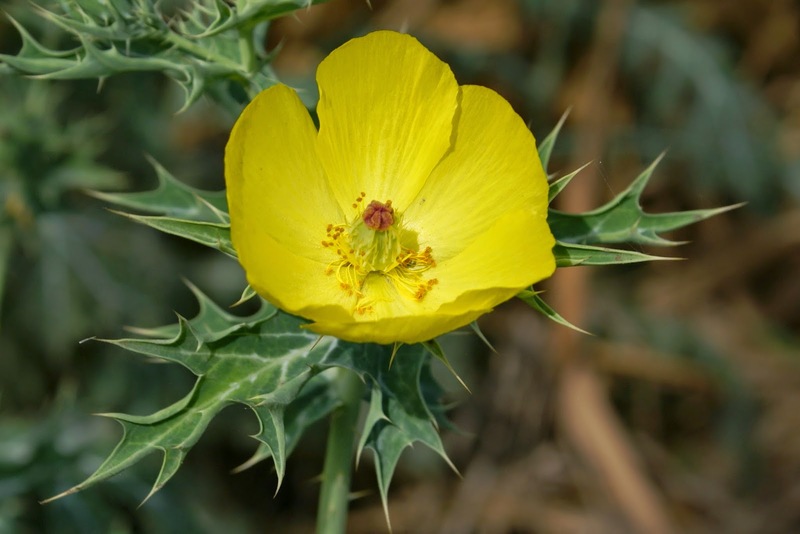 As mentioned before, an infusion prepared with the seeds of prickly poppy and used in small doses can be used as a mild tranquilizer for children. However, caution needs to be exercised while using the infusion, as when it is taken in large amounts, it is likely to work as a potent purgative. In addition, the seeds of this plant can also be used as a cure for poisoning due to snake bites. In Ayurveda, the ancient Indian stream of herbal medicine, prickly poppy is used as a diuretic, purgative as well as to eliminate the internal parasites. In addition, Ayurveda says that this herb is effective for curing skin disorders, leprosy, inflammation as well as fevers caused by problems of the bile. The roots of prickly poppy are considered to be anthelmintic (a medication that eliminates internal parasites, especially intestinal worms in humans). The juice extracted from the fresh prickly poppy plant is used to treat ophthalmia (inflammation of the eyes) as well as opacity (murkiness) of the cornea. In Peru, a plaster is made from Argemone mexicana and used to treat muscle pains. In the Caribbean islands the plant is used to remove warts and to treat sleep disorders. A tea made from the leaves is also used to treat asthma. In India, the latex is combined with cumin and oil and made into a paste which is used to treat skin diseases and flesh worms. In Africa, the leaves are utilized for their sedative and tranquilizing effects. The seeds of prickly poppy resemble mustard seeds and are used as a purgative and sedative. Since the seeds look like mustard seeds, many unscrupulous traders in India use them to adulterate mustard seeds. When the non-edible toxic oil extracted from the prickly poppy seeds is blended with mustard oil and taken internally by means of cooking, it results in dropsy (edema) - an unusual retention of fluids by the body. This herb is also used in homeopathy. The homeopathic medication prepared with prickly poppy is used for treating problems caused by tape worms. As mentioned earlier, the prickly poppy root is an alterative - a medication that helps to restore the healthy bodily functions. Owing to this property of the herb, it is extensively used to treat skin disorders. The flowers of the plant are said to possess expectorant properties and, hence, have been traditionally used to treat coughs and other chest problems. Although the dried leaves are typically the only parts of the plant available through various entheogen and ethnobotanical dealers, we are starting to see more and more seeds offered as word of the potential of this plant spreads. The collected latex, which is then dried into a tarry resin, reportedly has potent narcotic effects. These effects are most likely due to the interesting amalgam of alkaloids present in all parts of this plant, with the highest concentration found in a part that is rarely used or spoken of; the roots. It is important to note that the seeds contain TWO toxic alkaloids, sanguinarine and dihydrosanguinarine, so although the seeds seem to be safe to smoke, do not eat them if you chose to work with them. Symptoms of eating the seeds include nausea, vomiting, diarrhoea, breathlessness, limb swelling, and glaucoma. Death can occasionally result from cardiac arrest. Aregemone mexicana also contains isoquinoline alkaloids. The effects and possible uses of isoquinolines, a compound found in many plants, including cacti and poppies, have still yet to be fully explored. There is now a great debate amongst chemists as to whether or not isoquinolines have the potential for psychoactive effects.